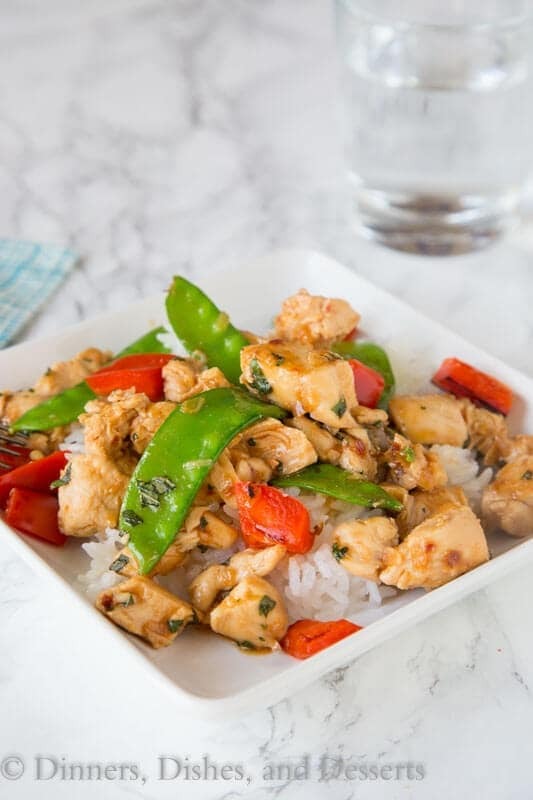 Spicy Basil Chicken – get dinner on the table in just minutes with the super easy chicken recipe. 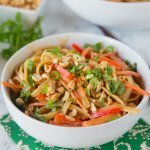 Great Asian flavors with just a little kick. Add veggies to make it a complete meal! I love and easy dinner ideas. Busy nights happen all year round, not just during the school year. So finding chicken dinner ideas you can get on the table fast during the summer is important too. 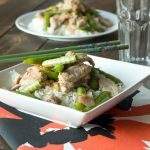 Basil grows faster than I can use it during the summer months, so this basil chicken is such a great use for it. 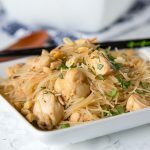 My family loves Asian recipes, in case you haven’t been here before. 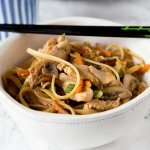 Chicken Lo Mein is definitely a staple in our house. Any time I can use up veggies in the fridge and avoid take out I am happy. 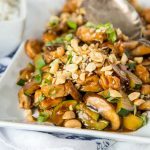 So Kung Pao Chicken is definitely a great quick dinner as well. Basil chicken is on pretty much ever Thai menu I have ever seen. But I can’t say that I have ever ordered it. It is usually in the running, but I always end up with Pad Thai. Well last time I picked something different, but it still wasn’t basil chicken. 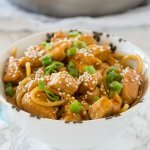 So when I saw this spicy basil chicken in Cooking Light, I knew that I just had to make it. I doubled the sauce so I could serve it over rice, and obviously added some veggies. My son only complained a little about the veggies. And by a little, I mean a lot. But he at them. You can also control how hot or mild you want to make this but adjusting the chili sauce. I used about 2 tsp (as noted in the recipe) and it had a tiny kick, but definitely not hot. So adjust as you go! I can’t wait until I have a garden full of fresh basil to make this chicken recipe again! 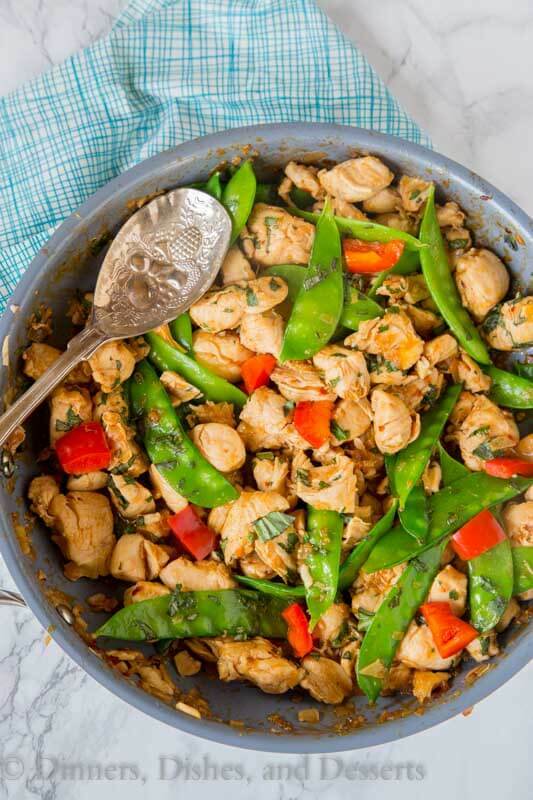 This basil chicken recipe is super versatile can you can just add whatever veggies you want. Traditionally in Thai cooking it doesn’t have a lot of vegetables, mostly chicken with big pieces of basil. But at home when I am making a chicken stir-fry, I like to bulk it up and it is a great way to get more nutrition into my family. Like most Asian recipes it is fairly simple. If you have a wok this is the time to bring it out. If not, just a heavy duty skillet will work. You want all of the ingredients prepped and ready ahead of time. Get the skillet super hot and then just add and stir. You need to work fast so you don’t burn anything, which is why having everything out and measured before you start is so important. 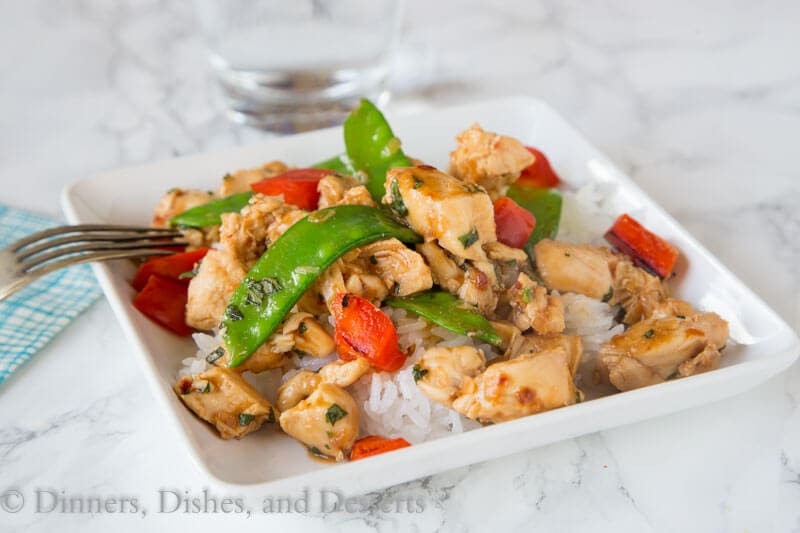 This Thai Basil Chicken is made with traditional fresh basil that you find in the US. If you have Thai basil, you can definitely use it here. But it is hard to find in normal grocery stores. How is Thai Basil Different? It is a basil that is commonly found in Southeast Asia. The leaves look different than what you might see in the states. It also has a different taste – more of a licorice or anise taste. It is a little sturdier, so it stands up better to cooking. 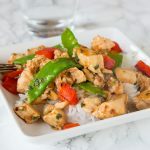 So if you find yourself with a bunch of basil on hand, this Thai basil chicken is a great use for it. 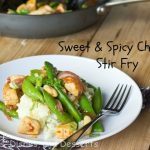 It is slightly spicy and you can turn this chicken stir-fry into a filling dinner by adding any veggies you like. I like to serve over rice with plenty of sauce to soak it up. 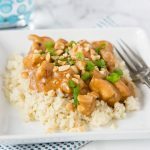 A great dinner that is ready in just minutes! Perfect for any night of the week. 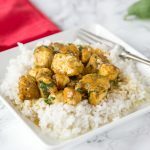 Spicy Basil Chicken - get dinner on the table in just minutes with the super easy chicken recipe. 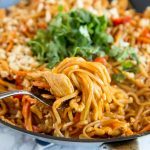 Great Asian flavors with just a little kick. Add veggies to make it a complete meal! Heat a large non-stick skillet over medium high heat. Add the oil, swirling to coat. Add shallots and garlic, stirring constantly, cook for 1 minute. Add chicken to the pan. Cook for about 10 minutes, or until cooked through. Add the bell pepper about 1/2 way through the cooking time. In a small bowl combine fish sauce, sugar, soy sauce, chile paste, water, cornstarch and salt. Mix well. Pour fish sauce mixture over the chicken once it is cooked. Add snow peas. Stir to coat chicken and cook for about 1 minute, until the mixture thickens. Remove form the heat and stir in the fresh basil. I’m a huge fan of quick and easy dinner recipes! This looks delicious, definitely one I’ll have to remember. I would put basil on everything if I could! 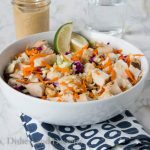 Love that there is so much of it in this recipe! I love that it is spicy. Lately I am craving spicy food. Looks delicious and perfect for any dinner! Congratulations to your son and the great work he did for the science fair! That’s quite an accomplishment, and I’m sure you’re all very proud! Speaking of proud, I’d be darn proud of your spicy basil chicken, Erin. I love that you added pea pods and red peppers. It looks utterly delicious and I’m sure my family would love it too. Pinning! This will be a great dish to make with all my homegrown basil this summer. I love your quick one pot meals. Great job! Congrats to your son too. Pretty smart guy. Erin, I adore this recipe. My family has a deep love of asian food too. We’d devour it in seconds. My husband loves recipes with strong basil flavor! This is a great recipe to make for him! That looks so dang incredible. 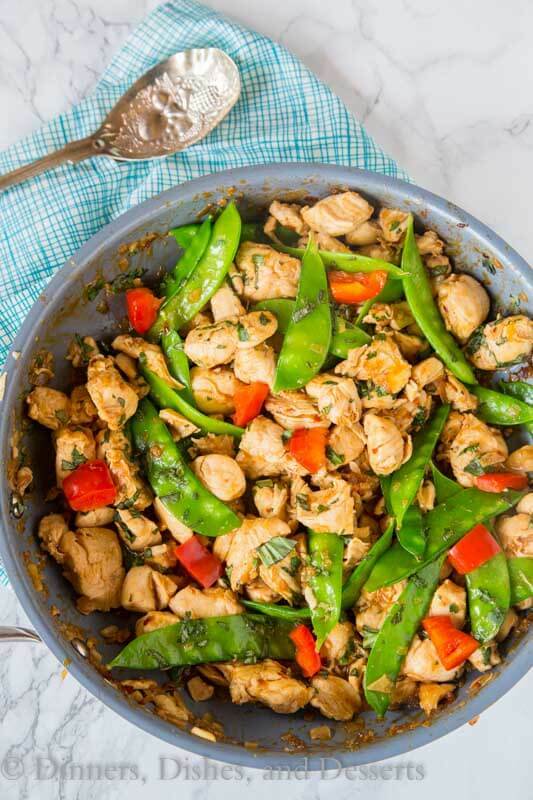 I LOVE basil chicken, but I am loving all those snow peas, as well!! I love 20 minute dinner meals! This looks delicious! I keep stumbling across your recipe so I definitely need to try it! 😉 Seriously I am going to put this on our menu for next week! We are huge Asian cuisine fans here too! Whenever I order Thai food spicy basil is always my go to. This looks awesome! This looks great! I’m going to try a vegetarian version of it! 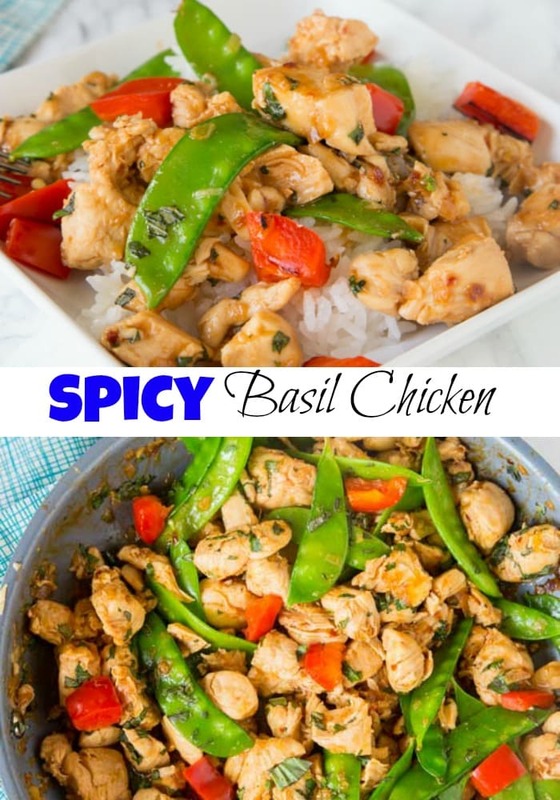 I was just looking at that Spicy Basil Chicken and it looks amazing! My favorite foods are Mexican and Chinese, so I come here a lot. My only problem with this and some other recipes I’ve run into lately is that I’m highly allergic to seafood of all kinds, the whyfore and whatfore I leave to the doctors, and mint, which doesn’t concern this recipe. When it comes to actual seafood as an ingredient, I simply swop out fish, or shrimp or whatever for chicken, pork , beef , or vegetables depending on the taste profile. When the fish or oysters or whatever are lurking as part of a sauce or dressing, it’s a little trickier. I note you have fish sauce listed, which is a no-go area for me. If it were only a teaspoon or two, I’d just leave it out. Two tablespoons though is quite a vacuum to fill and I don’t want to leave the sauce too bland or too scant. I tried to google substitutions, but they only advise soy sauce. With the soy sauce already in there, however low-sodium, I’m afraid this wonderful chicken will turn into a salty, soy bomb of a mess. Have you any other suggestions for me? I know it won’t taste exactly the same, but in this case close approximations will do. Thanks to anyone who can help. Melissa, Sorry for the late reply! I was out of the country. Fish sauce is kind of a mix of tangy and sweet. So a mixture of brown sugar and lime juice will give you some of the same flavor. I would try 1/2 an 1/2 and see how it goes. You can then adjust the levels while it is cooking. Hope it works for you! This looks like such a hearty meal!! I have a garden full of basil! This will be a perfect meal this week! I also love how I can control the heat! What a great dinner option! Thanks for giving recommendatons for adjusting the spice level! This looks so yummy! Need to try soon! 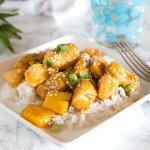 It looks perfect for an easy weeknight meal! SO flavorful! This looks and sounds so good! Love a little spice in my dinner sometimes!